We chat with software engineer Elecia White about embedded programming, self-driving cars, and why internet appliances must connect to the web more quickly and easily if they are to find commercial success. 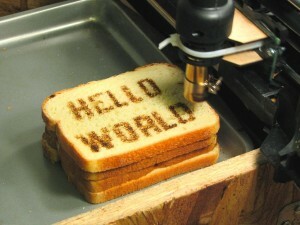 Carmen is looking forward to burning images of Darth Vader or Fry from Futurama into his morning slice of toast. Rather than looking at pre-programmed images when he butters up his toast each day, Jeff envisions reading the day’s weather forecast, or reviewing the best route to work. Despite a multitude of promises that the Internet of Things will improve our lives, there seem to be a lot of technical and social details that have yet to be sorted out. We continue to look for listeners willing to share their engineering stories with us. Please use the Contact page to let us know of your interest! Our guest for this episode is software engineer Elecia White, co-founder of Logical Elegance, an embedded systems consulting company based in San Jose, California. We determine Brian was the only co-host to play Command and Conquer, as he seems to be the only person knowledgeable about the proper use of engineers in that video game. Although not taught as frequently in engineering universities as it once was, the Fortran programming language is still widely used for numerical analysis. There are a variety of definitions for an embedded system. Our guest notes that an embedded system needs software (thus requiring it to include a programmable computer), but is not itself a general-purpose computing device. Brian asks about the relative importance of being familiar with more general concepts and protocols, such as I2C and SPI, versus understanding vendor specific commands and methods. Sam Feller’s analog clock is mentioned by Carmen as an example of a hardware product requiring a great deal of engineering effort. Embedded system programmers usually come from either a computer science or electrical engineering background. While many employers want to hire “full-stack” developers that can handle all types of programming needs, our guest points out that it is virtually impossible to be equally proficient in all areas of programming. Elecia recently served as a judge for the 2014 Hack-a-Day Prize. A least one internet toaster actually exists, as it reportedly attempts to find a new home if you don’t use it frequently enough. It is also possible to remotely determine how many eggs are in your refrigerator. As explained in an xkcd comic, many of our existing problems can be cured be developing yet another standard. An Electric Imp developer was interviewed last summer in Episode 202 of The Amp Hour podcast. In a previous job, our guest worked for ShotSpotter, a company that produces a gunfire detection system. Elecia discussed various aspects of interviewing in Episode 51 of her podcast, Embedded.fm. The EggBot from Evil Mad Scientist is mentioned as potentially providing inspiration for a new type of toaster. Our guest can be found on Twitter as @logicalelegance, and can be reached via the contact page on her Embedded.fm website. Thanks to Windell Oskay for use of the image titled “hello, world.” Podcast theme music by Paul Stevenson.